If you have a PSN account add me on there! I have very old PSX and fat PS2 (first wave too), but for a change I bought X360. I really like the controller, but the extra pay for the internet (Xbox gold) is stupid. in... a school swimsuit... I mentioned that you have good taste? Harvest Moon is fun! I have this game for PSX. 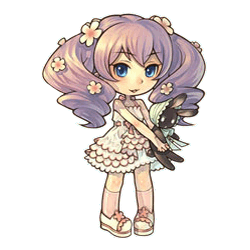 Want to see my super loli wife in Harvest Moon? I sent you a friend request but oh God no your avatar. No no no no no no. So I play psvita like a ton and it has this feature called "near" where you can see nearby players. And this dude with that terrifying frog avatar was within like 2 miles from me. It was like 3am and he kept circling around me and kept getting closer. My brother and I made so much jokes about a literal frogman coming into our home and hurting us, I laughed so much. I would say thing like "you go to bed and you hear "goodnight" from the window" and "you see a frogman looking through the window in the front door". These jokes went on for DAYS. I mainly play vita the ps3 is in my brother's room because he plays it way more and has a huge tv. Himeko Katagiri wrote: I sent you a friend request but oh God no your avatar. No no no no no no. So I play psvita like a ton and it has this feature called "near" where you can see nearby players. And this dude with that terrifying frog avatar was within like 2 miles from me. It was like 3am and he kept circling around me and kept getting closer. My brother and I made so much jokes about a literal frogman coming into our home and hurting us, I laughed so much. I would say thing like "you go to bed and you hear "goodnight" from the window" and "you see a frogman looking through the window in the front door". These jokes went on for DAYS. I mainly play vita the ps3 is in my brother's room because he plays it way more and has a huge tv. But i'm seriously considering making the jump. I've never owned a PlayStation product before (Nintendo and Steam 4life) but as I get older and have more money, I'm considering opening up. I still don't know if I'll get a PS3 or PS4 though. Who knows maybe E3 this year will further push me into which direction I'll take. Get a PS3, buy MGS1, the MGS HD Collection and MGS4, and play all of them in release order. Going back on topic: regarding playstation consoles I have PSX and PS2, so no ps network for me. And I don't have an online account with Xbox360 either. I still like to play with pals in the same room. With Nintendo 64. From what I've seen, MG doesn't look like my type of game. I played a demo of Snake Eater on 3DS. Also what if Naughty Dog re-releases TLoU on PS4 in 1080p/60fps!?!?! Yeah I'd hate to get the inferior version just to see the definitive version come out a few months later.